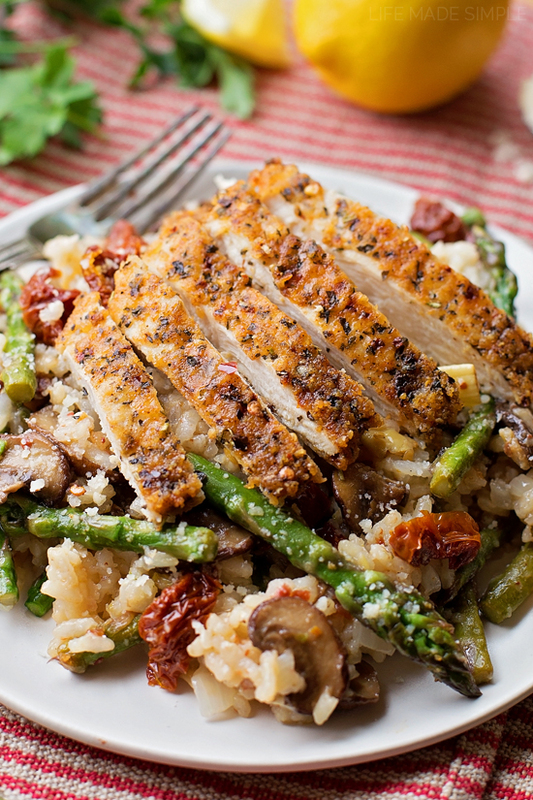 This parmesan chicken “risotto” is comfort food at its best! It’s buttery, flavorful and loaded with chicken and veggies. A few weeks after the birth of our second child, friends from church brought us the most amazing dinner! It was a risotto-like dish loaded with sautéed veggies and topped with crispy, crusted parmesan chicken. We licked our plates clean and went for seconds (our toddler too)! I knew I had to ask for the recipe. How could I not? It was absolutely delicious, our entire family was smitten. Chase told me it was something he had whipped up without a written recipe, so he graciously offered to re-make it. He showed up at our door with a big dish full of it along with the coveted recipe. I cannot thank him enough for all of the time and effort he’s dedicated to this dish. 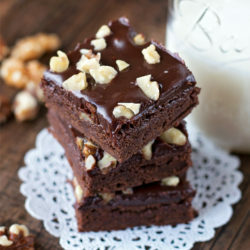 We will definitely treasure this recipe forever, I hope you will too! I’ve made his version three times now, adjusting it a bit here and there. 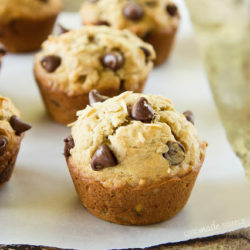 The recipe below is perfect for our family of four, it leaves a little bit leftover for lunch the next day, which is always a bonus! So let’s get started, shall we? 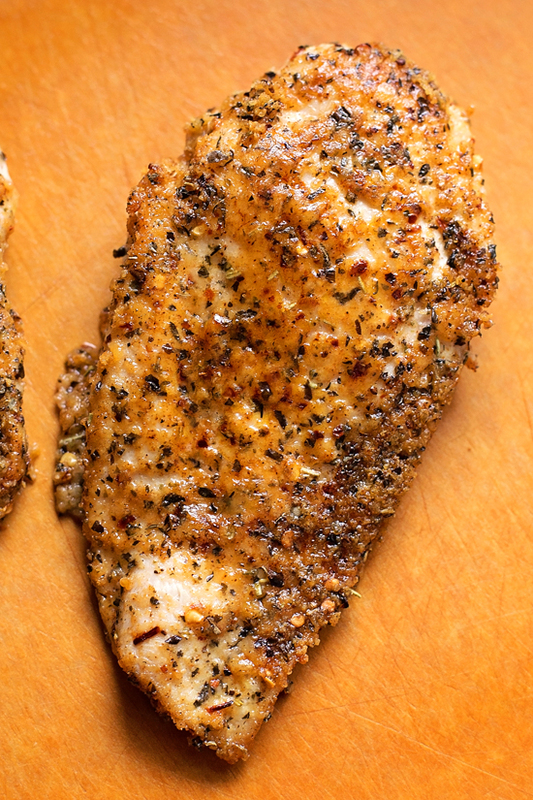 First, you’re going to want to coat your chicken in the mixture of cheese & seasonings. Yep, no breadcrumbs here. Just cheeeese! Then you’ll toss it into skillet and sear both sides until golden brown. Transfer it to a lined baking sheet and toss it into the oven for about 10-15 minutes or until the chicken reaches an internal temperature of 165 degrees. Remove from the oven and let it rest. It should look nice and golden brown like the picture above. While the rice is cooking, set large skillet (I just wiped out the one I used for the chicken) over medium heat, add the olive oil. When the oil is hot, add the mushrooms. Cook until brown (like the picture above- the browner the more flavorful they’ll be, so take a bit of extra time to get them nice and dark), then add the asparagus. Cook for an additional 3-5 minutes, then add the sun dried tomatoes along with the reserved oil, artichokes, garlic powder, salt, pepper and lemon juice. Combine the vegetables with the rice (I usually toss them into the Dutch oven), then season with salt and pepper to taste. Transfer to a large casserole dish and top with slices of cooked chicken. Garnish with a sprinkle of grated parmesan. Serve it up while it’s still hot and watch it disappear before your eyes. This will forever be a favorite at our house. It’s crazy flavorful, loaded with the perfect combo of veggies and topped with the easiest, cheesiest chicken you’ll ever make. Give this one a try, you’re gonna love it! 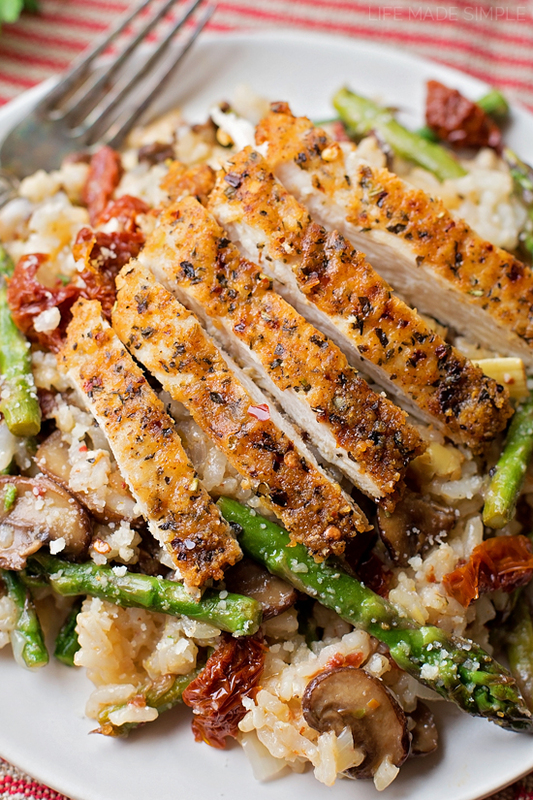 You're going to fall in love with Chase's Parmesan Chicken "Risotto." 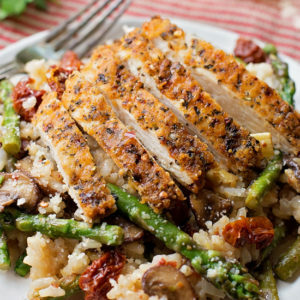 It's flavorful, comforting and loaded with chicken and veggies. Preheat oven to 350 degrees. Line a baking sheet with parchment paper or a baking mat; set aside. Place a large skillet over medium-high heat, add the olive oil. In a shallow dish, combine the parmesan, red pepper flakes, Italian seasoning, garlic powder and paprika, using your fingers, mix together. Place the chicken in, one at a time, pressing to form a breading or coating on the chicken. Place into the hot pan and sear each side until golden brown. Transfer to the prepared baking sheet and bake until the chicken reaches an internal temperature of 165 degrees. Remove from the oven and allow to rest. Meanwhile, set a large stockpot or Dutch oven over medium heat, add butter. When the butter melts, add the onion and saute until translucent, about 3-4 minutes. Pour in the white wine and reduce until the onion is moist, but not swimming. Add the rice, then the chicken broth. Bring the mixture to a boil, then reduce, cover and allow to cook for 20-25 minutes or until all of the liquid has been absorbed. You may need to add up to ¼ cup of extra broth if your rice is still firm. Once the rice is fully cooked, turn the heat off, cover and allow to sit for 5-10 minutes. While the rice is cooking, set large skillet (I wiped out the one I used for the chicken) over medium heat, add the olive oil. 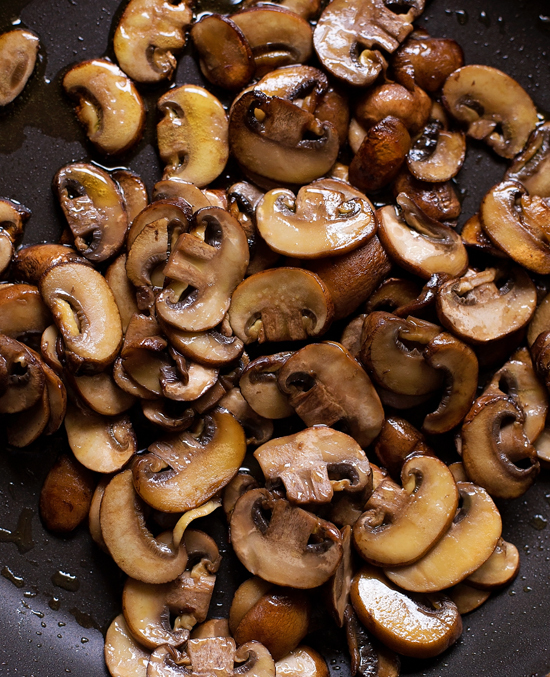 When the oil is hot, add the mushrooms. Cook until brown, then add the asparagus. Cook for an additional 3-5 minutes, then add the sun dried tomatoes along with the reserved oil, artichokes, garlic powder, salt, pepper and lemon juice. 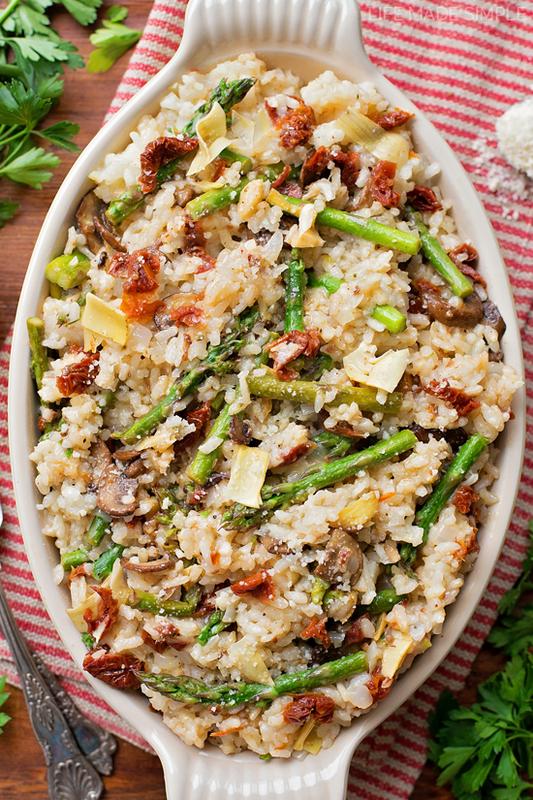 Combine the vegetables with the rice, then season with salt and pepper to taste. Transfer to a large casserole dish and top with slices of cooked chicken. Garnish with grated parmesan if desired. -If you don't want to use the white wine, simply omit it. 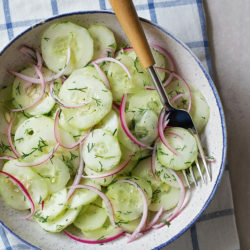 It adds a nice flavor to the dish, but is not absolutely necessary.